There’s no question: Seeing mountain gorillas in the forests of Uganda and Rwanda is, for many wildlife enthusiasts, the apex of their globe-trotting adventures. But that’s not the whole story for the two African nations; they’re also home to numerous other species that are spectacular in their own right. 1. Tree-climbing lion: There are only two known populations of lions who regularly climb fig trees, and Uganda’s Queen Elizabeth Park is home to one of them. 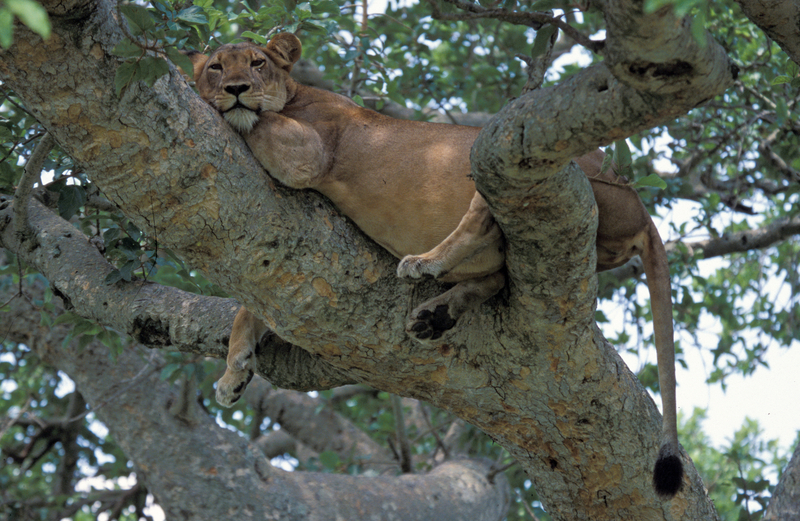 Seeing the big cats draped over branches is an incongruous site and well-worth the visit. The reason for the unusual behavior is unknown; one theory suggests that the big cats climb trees to avoid the irritating tsetse flies, while another speculates that the lions enjoy cooler temperatures up high. 2. 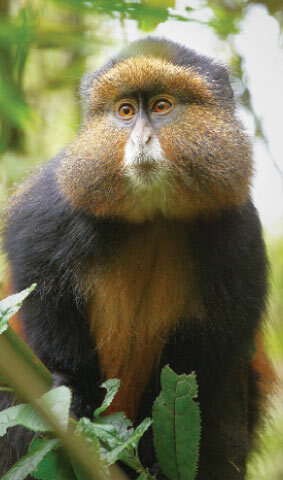 Golden monkey: The at-risk golden monkey, recognizable by its orange body and dark-colored limbs, is found in both Rwanda and Uganda. In Rwanda’s Volcanoes National Park, two troops are habituated to visitors, and treks to find them operate similarly to the park’s mountain gorilla treks. Guided groups are capped at 30 and visitors can spend an hour with the monkeys. Get your shutter speed ready; if they’re not munching on bamboo, the monkeys are often swinging from tree to tree and comically chasing after one another. 3. Forest elephant: Though difficult to see, the elusive forest elephant can be found in Uganda’s Kibale National Park and Bwindi Impenetrable Forest. 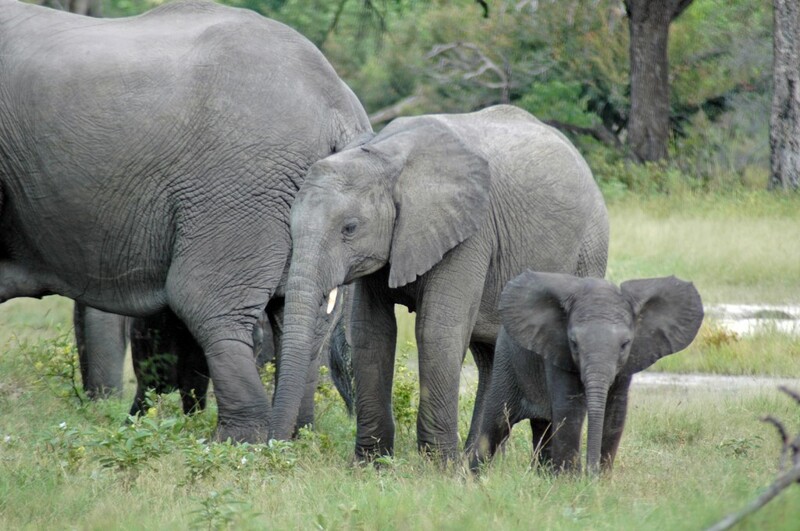 The African elephant subspecies, which resides in heavily wooded rain forests, is smaller than its savannah counterpart; its ears are also more oval in shape and its straight tucks point downward. 4. 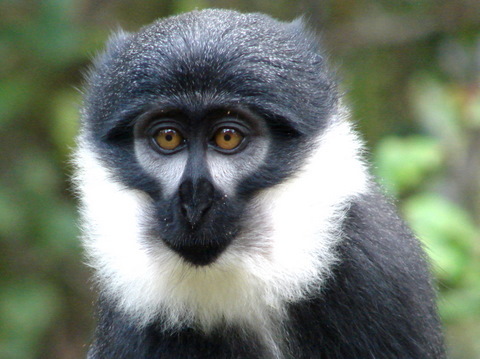 L’Hoest’s monkey: Easilyidentifiable by their bright orange eyes and white “beard” that contrasts with an otherwise dark coat, L’Hoest’s monkeys are found in both Rwanda and Uganda. Though they eat and sleep in trees, L’Hoest’s monkeys typically travel on the ground, aided by narrow feet, as opposed to swinging from trees like many other monkey species. Deforestation and hunting for bushmeat have decreased the monkey’s numbers, causing the International Union for Conservation of Nature to list the species as vulnerable. 5. 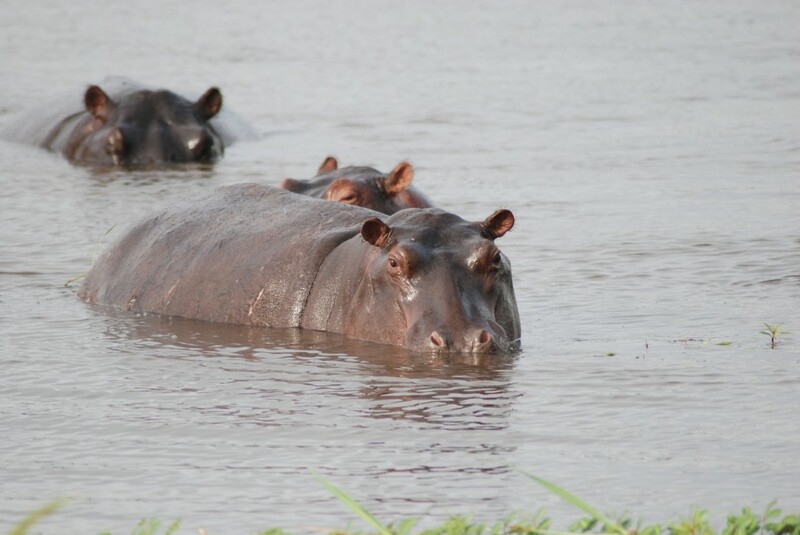 Hippo: Though hippos are found through much of Africa, the Kazinga Channel in Uganda’s Queen Elizabeth National Park boasts the world’s largest concentration. Hippos are, of course, excellent swimmers but they’re also surprisingly fast on land, reaching speeds of up to 30 mph. 6. Chimpanzee: Though most commonly associated with the forests of Tanzania, about 1,450 chimpanzees reside in Uganda’s Kibale Forest National Park. 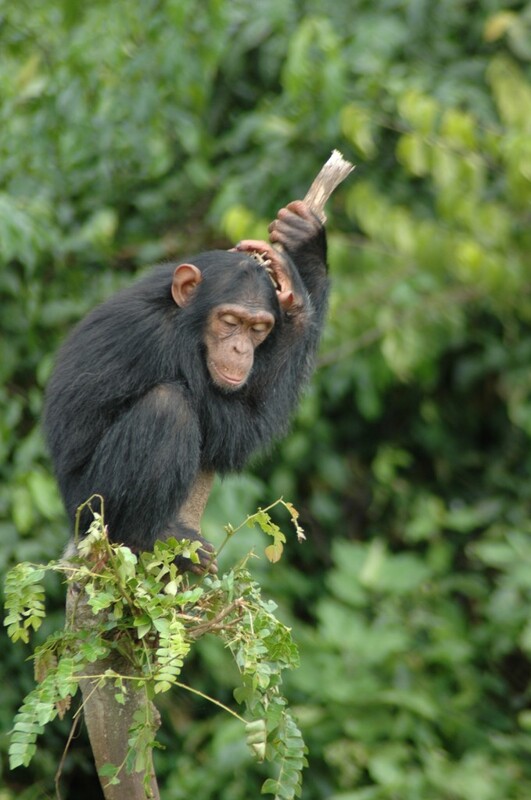 Trackers keep tabs on the location of a group of habituated chimps, so chances of seeing them are excellent. Looking through the foliage, you may see the primates knuckle walking, grooming one another or swinging amongst the tall trees. You’ll also likely hear their iconic, raucous pant hoots. 7. 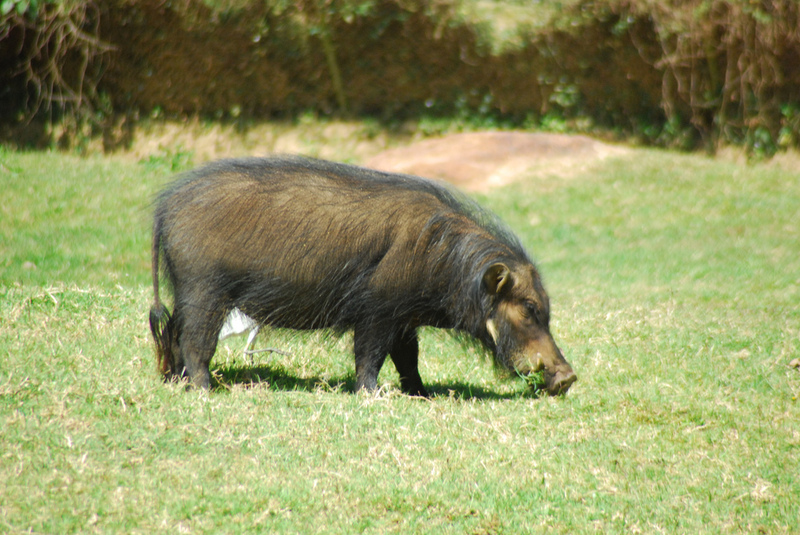 Giant forest hog: Reaching up to 600 pounds, the giant forest hog is Africa’s largest pig, and its range includes both Uganda and Rwanda. Not scientifically identified until 1904, there’s still much to be learned about the species. Recent discoveries have revealed the hogs to be highly adaptable, both in terms of habitat and diet. They are hunted locally as a food source, and scientists are concerned about the hog’s declining numbers. Travel to Uganda and Rwanda with WWF and NatHab. Wow is all I can say about Uganda and Rwanda. I have lived and seen these animals ever since I was young but I have never stop marveling at the wildlife this country has.